Sometimes things are just not meant to be. 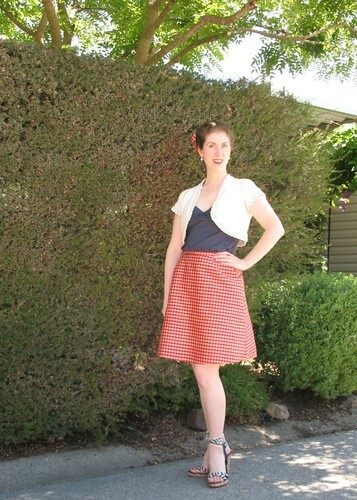 I had a fabulous idea for a skirt version of Sewaholic’s Cambie Dress. The wonderful striped fabric from this dress was going to make a great cotton skirt, or it might have . . . Unfortunately, I remembered a whole lot more yardage left in the stash than what actually existed. Whoops. 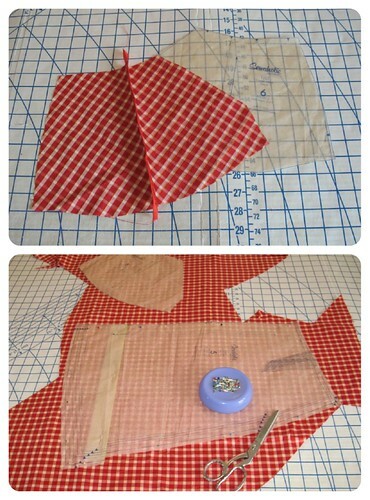 Not to be deterred, I pulled out a checkered silk, remnants from this project. Because of my extremely limited yardage, I had to shorten the skirt by three inches (not ideal), and hand roll a very narrow hem. But I did manage to get everything cut out. 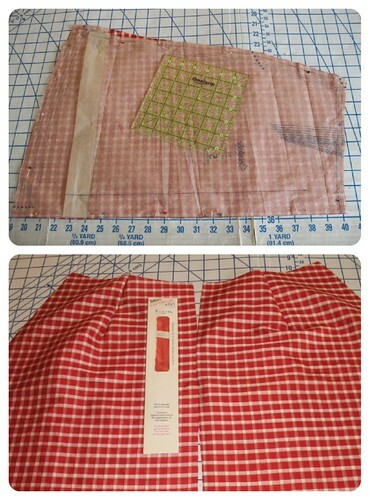 The pockets on this pattern (which I love, by the way) are quite large. I did not have enough to cut two complete pieces. Because they are part of the design, I did not have the option of leaving them off. What I ended up doing was using the foldline as a seam. 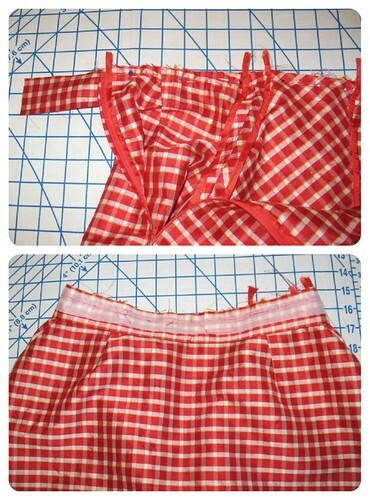 Because I was not going to be able to match the checks with my scraps, I cut the pockets on the bias so nothing would match at all! 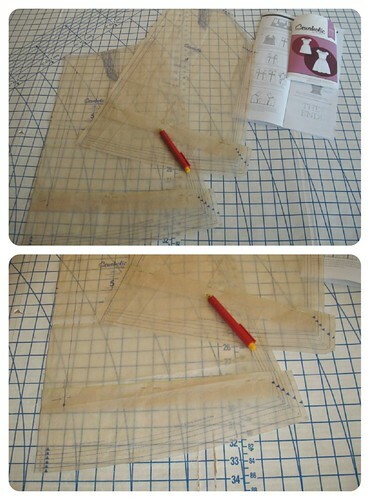 Making a dress pattern into a skirt is extremely easy. 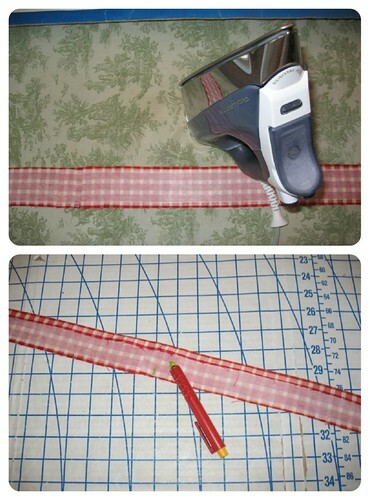 And it is a great way to double your pattern stash. 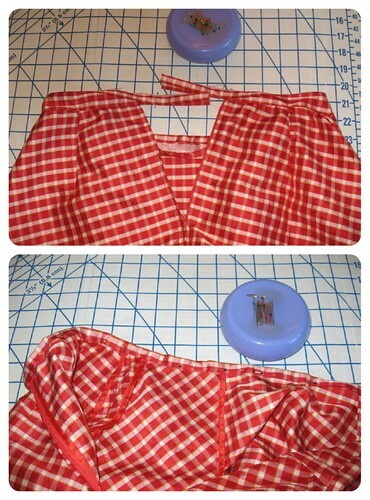 Something to keep in mind is a skirt that is hanging from a bodice does not have to be very tight to fit properly. Most skirts these days do not sit at the actual waistline, which is why the side seam always manages to migrate to the front. 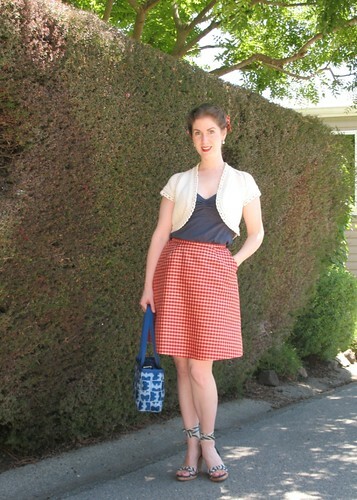 I like my skirts to stay put, and the easiest way to accomplish this is to wear a skirt at my natural waistline. There are two ways that I pulled in some of the extra ease. First, I increased the width of the darts at the upper edge. I also used a gathering stitch at the center back to pull in the remaining excess. 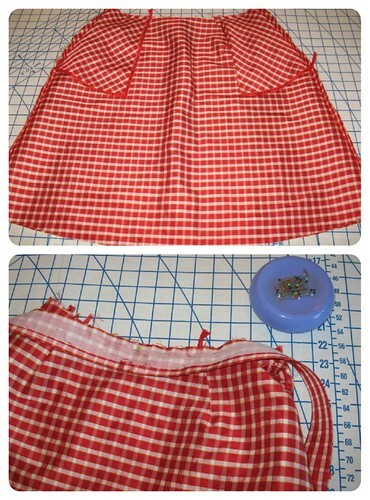 The waistband piece included with the pattern works perfectly – just keep in mind that you may have to shorten it if you want your skirt to sit at your true waist. If you want to wear the skirt lower on your hips, I would suggest a contoured waistband. But for my purposes, a straight rectangle works perfectly. Just remember that you will need an extra bit of fabric on either end to account for a seam allowance plus an extra tab to keep any hook & eye hardware away from the skin. And I put those strangely shaped little scraps to use. 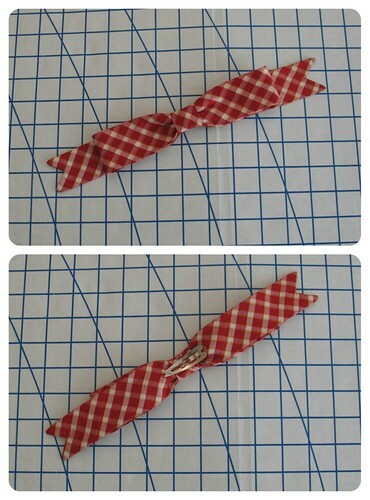 With a slightly modified version of Casey’s tutorial, I made myself a new hair bow. Headbands are super cute, but they give me a headache, so I used a small clip in its place. This also makes it possible to move the bow around depending on my hairstyle mood. And no, I do not plan on growing up anytime soon, or listening to anyone who says I cannot wear bows in my hair! Purse: Harvey's Seatbelt Bag "Bow Tide Blue"
Pretty outfit. 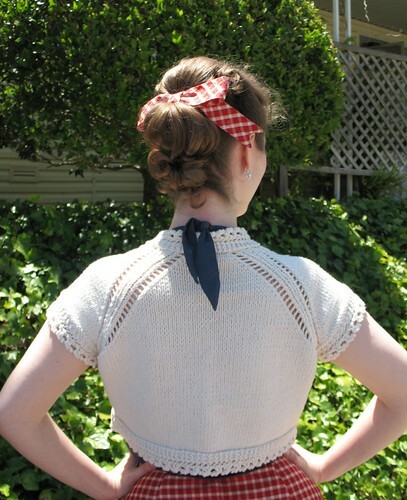 The skirt is lovely but I particularly like the cardigan. That Lacey detail around the edges is lovely. What a beautiful way to use up a remaining piece of fabric! This is a lovely skirt! You look great, a new hem length for you. But you have super legs, woth showing off. 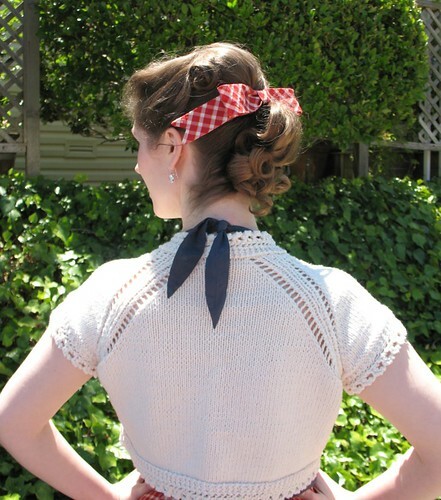 I love this, such a simple idea and a very elegant garment for such limited yardage. I love the little bow (headbands give me a headache too). I absolutely adore every component of this outfit!!! Very cool alteration. Thanks for the great idea. 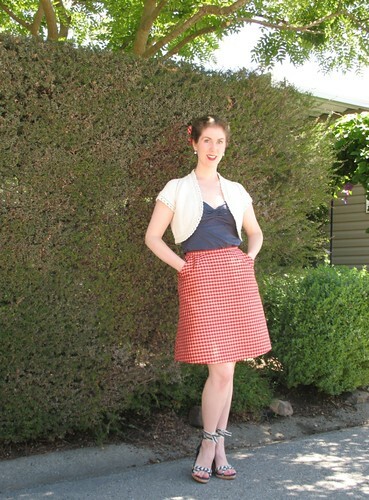 I made a skirt from my Cambie pattern, too! It's a great pattern for that. Yours is adorable! One would never know that you set out with any other project in mind, as this skirt looks absolutely fantastic and like it was destined from the get-go. Love the matching hair bow, too - so cute! Love the comment about bows in your hair. My friend was asked if she can wear black. 'I can wear any colour I want' she replied. Now, that's one good attitude! I am with you, when I cut out the Cambie dress I thought, 2 for 1, this would make a great skirt. Thanks for showing yours, lovely. Beautiful, classic, but modern too!